Patchwork quilt made up of 100mm multi coloured squares in a variety of materials including cottons, synthetics, lurex, plain and printed. Each square has dacron padding and is then joined in strips and the strips joined. All hand sewn. The backing is blue synthetic whole cloth 60mm of which is returned to the front to form a border. Amy Shore always said the only sewing she did all her life was darning and mending and making Wagga Rugs from jute, wheat or flour bags with cretonne top and backing. In the 1970s her daughter showed her how to make the quilts because 'she wasn't much good for anything else'. 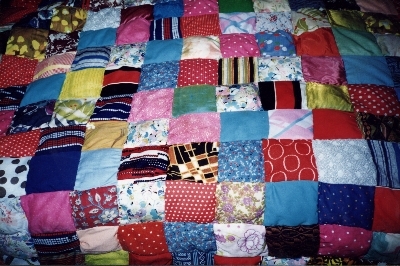 Amy made this quilt, one of many, at Murray's Crossing near Tumbarumba NSW in the 1970s. She donated it to The Pioneer Women's Hut. It is displayed occasionally. 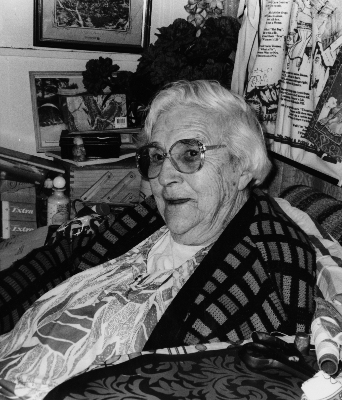 Amy Shore (1901-1999) was married in 1919 and had 8 children. The family always lived on a farm and it was a struggle. "Not long after we came here [Munderoo] things weren't very prosperous and it was coming on Christmas so the boys and I got a drum and made eucalyptus oil to get some money for Christmas. It is quite an interesting job. Anyway we made a gallon and got 9 pound for it. We also sold beeswax from the native bees to old Mather the skin buyer��..
As my family grew bigger and got older, like all teenagers, were wanting better clothes but money was scarce and not much left after feeding six kids and ourselves. So at one time the kids and I went around to find some dead beasts and get the hair off the manes and tails. We would bring it home and wash it in water and eucalyptus and hang it on the fence. When it dried we would take it in to the old skin buyer. It was a good price as it was wanted to stuff saddles with." Amy Shore 1997. Photo courtesy Tumbarumba Times. Cotton quilt made in the USA. The pattern is 'Nine Patch'. The quilt is machine pieced and hand quilted. The backing is cotton material possibly shirting. The padding is cotton. Quilt in pattern known as 'double weeding ring'. All cotton, using old prints, plaids, checks and solid colours, with plain blues and red squares at the intersections of the circles. White background. Hand pieced. Padding is Hobbs Heirloom: cotton 80%, polyester 20%. Backing is cream quilted cotton. 2500 x 2100 mm. Crazy patchwork quilt made from silk, brocade and velvet pieces, the seams covered with feather stitching in yellow silk. Fabrics are plain, and patterned with tartans, woven spots, stripes and floral brocade. Colours are rich, mainly red, pink, blue, green and cream. Quilt has a patterned velvet or velour border with urns and flowers in pale olive green and black, edged with a fringe in these colours. Reused parts of hand knitted woollen jumpers patched together. Wide crocheted edge from wool unravelled from jumpers retrieved from the tip. Double sided quilt. Side 1 has an off centre frame based on a hexagon and including triangles and squares in a concentric pattern. The borders are all small rectangles with a single strip of large rectangles at one end. Side 2 has a central patch of pieced shapes appliqued to the background. The borders are squares and rectangles many in striped shirting cotton. Side 1 has minimal quilting to the interlining but it does not go through to side 2. The padding is a thin sheet. The circle (sometimes pieced hexagons) is common to other 'Craigmoor' quilts.